Our salvage service means that your scrap or salvage vehicle can be collected and recycled in a responsible manner. Scrap Car King is a leading car scrapping company. Operating in London, Kent, Essex and Hertfordshire, our team work hard to ensure that we conduct and manage responsible car recycling, disposal and salvage of other materials up to 10 years old. 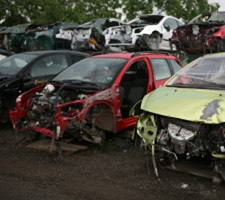 Where other companies may offer you a higher price for your scrap car, we have to warn you that there are others operating in the area that will offer you a lower quote when they arrive. We have specialist vehicles to help our team remove the most difficult of vehicle. Whether you have a car stuck down a narrow driveway, a heavy goods vehicle that has broken down, or a motorcycle that you need us to collect and either salvage or scrap then we can help. Scrap Car King has the capacity to attend to your call when it is convenient to you, and we use impressive removal techniques no matter what your query. And we can attend in an emergency, should your car need to be salvaged or scrapped and is on a public road or has run out of insurance. Call our specialist car removal team today to find out more on 07758 224112 or fill out our form for a quote today.